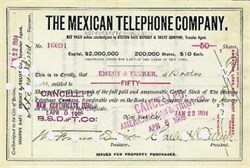 We are offering this beautifully engraved authentic Stock Certificate issued by Mexican Telephone Company dated in the 1890's. This cancelled certificate is hand signed by the company's officers and is over 100 years old. This will make a nice historical addition to your collection or a great gift for someone special.